Living in California means that we are fortunate to always have such beautiful weather (ok, yes we have the Santa Ana Winds and the occasional Winter “storm” but overall, we have gorgeous weather)! Now that Summer is officially here, we thought we’d share one of our favorite drinks, Summertime Lemonade. After weekly purchases from the lemonade stand at our Farmers Market (Redlands Market Night-we sell cupcakes there weekly), we decided to make our own lemonade from the many lemon trees at our home. We started with a strawberry lemonade (my personal favorite). It was tangy and sweet- but with the inconsistency of the sweetness from strawberries in season, this was not something that we can always get the same taste from. Regular old fashioned lemonade was the thought when we created our recipe. We wanted something we can keep at home for our families and something that we can jar up and take to the summer picnics, bbq’s, and the beach. After a few recipes tried, we were inspired to create our own. 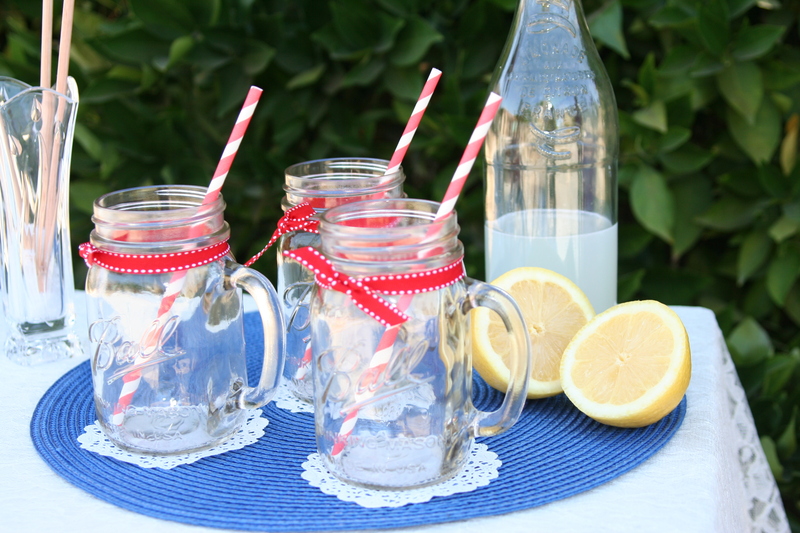 Here is our Summertime Lemonade recipe // we hope you enjoy it as much as we do!! step 1: create Simple Syrup. Heat sugar & 1 C of water in a saucepan and stir. Combine just until sugar is dissolved and remove from heat immediately. Cool to room temperature by chilling in the fridge or leaving on counter. step 3: in a large pitcher or serving container, combine chilled simply syrup, lemon juice, and 7 cups of water. Stir until combined and chill until ready to be served, or serve over ice if you like a cooler lemonade. note: lemonade can be store for up to 1 week in the refrigerator. I prefer to made my lemonade a few hours in advance to allow flavors to blend. Add your favorite syrup for a new lemonade taste. Tip: I LOVE Monin syrup in my lemonade for the special flavor, I choose Pomegranate (I add 1 Tablespoon to each 8 oz glass). Next Next post: Holy Guacamole! !